Rob turned 30 earlier this month, and we threw a big party. I didn't want it to be too elaborate and fancy, because that's not him at all. Nor would a "theme" seem appropriate like it would for a kids party. I wanted there to be plenty of good food that incorporated some of his favorites. 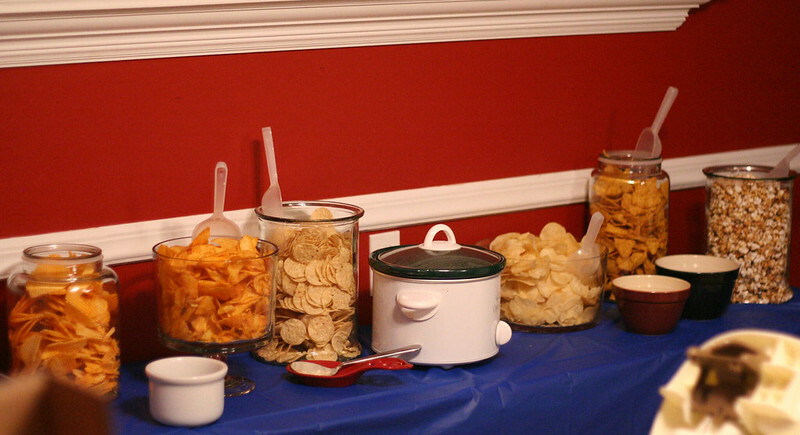 But then I also saw this fantastic idea on Pinterest to do a Chip Bar. I immediately planned to do it because we love chips in our house. 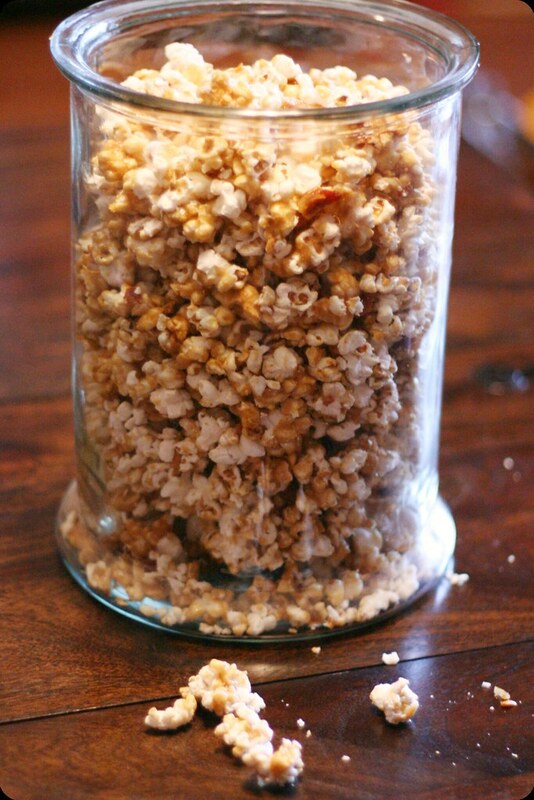 When talking with him about this idea he asked me to make this specific caramel corn a coworker brought in for a Holiday Pot-Luck. I'd tried it that year, but I guess she adapted the recipe because he didn't remember there being any sort of heat or spice, and the original recipe called for cayenne pepper. So this time I adapted a few recipes and he was very happy with the results. So was Tyler, much to my freaking out. For those of you that don't have young kids - they're not supposed to eat popcorn, it's a big choking hazard. But, I dropped some, he ate it and kept asking for "mo, pwease", while signing "more". It was too hard to resist, so I became a master at picking off the fluffy part of the popcorn for him. This popcorn really has everything. It's sweet, salty and nutty. And highly addictive! Preheat oven to 200 degrees. Line rimmed baking sheets with foil and coat with non-stick spray. Coat 2 heat-proof spoons or spatulas with non-stick spray. Heat popcorn and pil in a covered heavy large pot over medium-high heat until the kernels begin to pop. Using oven mitts, hold lid on pot and shake pot until popping stops. Pour popcorn in a very large bowl. Add bacon and cashews. Sprinkle with coarse salt and toss to coat. Over medium heat, combine butter, brown sugar, 1 teaspoon salt and corn syrup in a sauce pan. Boil for 5 minutes. Remove from heat and stir in baking soda. Stir well. Pour over popcorn mixture, stirring to coat well with sprayed spoons/spatulas. Transfer to lined baking sheets. 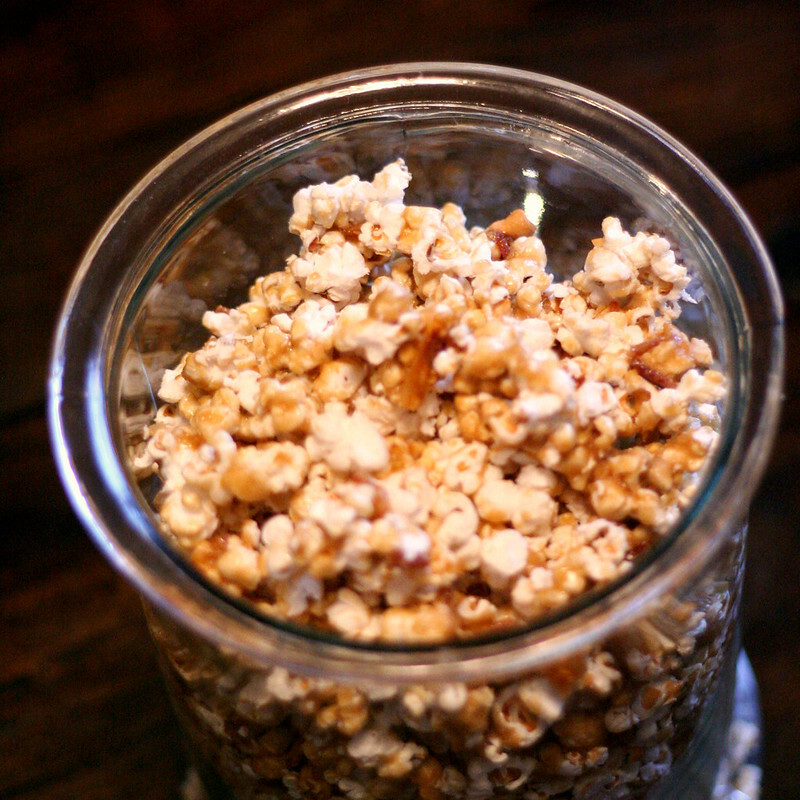 Bake until caramel is shiny and coats the popcorn, tossing mixture occasionally, about 45 minutes. Cool completely on the sheets on cooling racks, tossing occasionally to break up large clumps.